I love surfing. But sometimes, 2.5- 3 hour drive from Seattle to the coast makes it hard ( if not impossible ) to catch a wave. Even if you make it to the coast, there is no guarantee you'll have a stoked surf session. Like any surf, the Olympic Peninsula can be flat, blown out or too big which is a bummer after a long drive. When ocean waves are a distant dream, some surfers will go to great lengths to improvise worthy rides. I've already posted about tanker surfing in Texas. Here in Washington, a small but dedicated group of die-hard surfers/paddlers started surfing freighter and tug waves on stand up paddleboards ( SUP ) on the Salish Sea in the Shilshole Bay. The Salish Sea is an overlay which includes and unites the established and familiar names of the various water and land bodies (the Strait of Georgia, Strait of Juan de Fuca, Puget Sound, Gulf Islands, San Juan Islands, etc.). The Salish Sea is connected to the Pacific Ocean primarily via the Strait of Juan de Fuca. The shorelines along both the Canadian and US side of the Strait have been popular surfing spots for years. 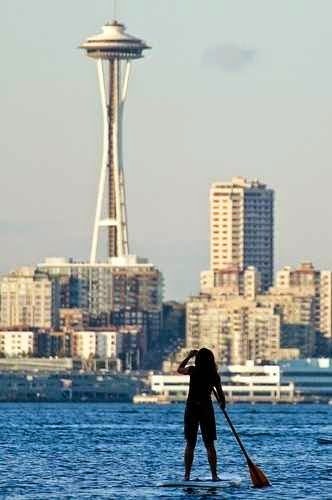 But not many surfers know that you can catch decent size waves right here in Seattle ! Unlike regular surfing or SUP surfing, freighter wave surfing requires a lot of planning, and extensive knowledge of local beaches, wind, tides, and marine charts to determine where the main flow of shipping is. Waves can be created by everything from small power craft, yachts, the occasional tugboat and even container ships. But it's the tugboats and freighters that put out primo waves. They ride deep in the water, and have massive twin engines that each put out 2,500 horsepower. All of that combines to make nice, big waves of about 4 or 6 feet. With the right combination of a proper tide, weather conditions, and certain fast moving boats freighter/tug surfing on Puget Sound makes it all worthwhile. The waves are just as clean and well formed as the best coastal surfing spots, and freighters can, at low tides, offer up to 6' faces and very long rides ! Catching freighter/tug boat waves is a pretty good alternative to a long trek to the ocean. If you're tired of those long day trips to Westport or Neah Bay, give paddle-surfing a try ! If you are interested in trying out freighter/tug surfing, subscribe to our email or join our Facebook page for upcoming classes !